After 6 months after release Katy Perry’s album is finally warming to us and of all tracks on the album we are glad that Birthday will see the light of the pop charts. The upbeat infectious track will serve the singer well as it brings the fun back to the KP camp we have become accustom. 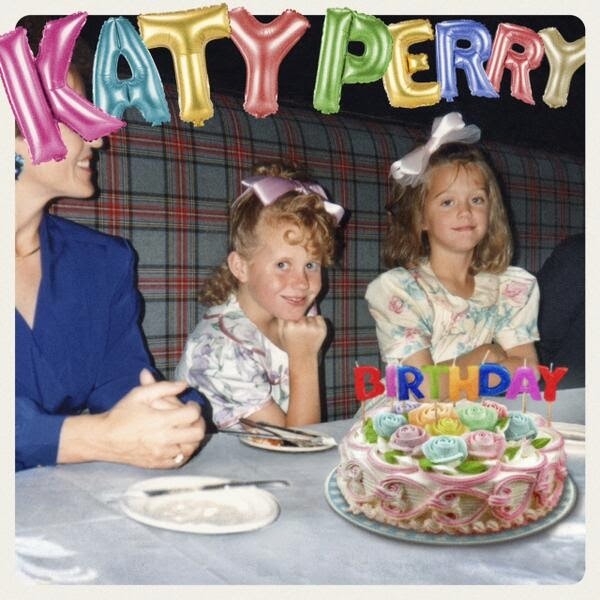 After the pop princess recently unveiled the new artwork for her latest single which is an old school snap from her own birthday bash - titled "KATY PERRY". The old photo features a young Perry in an adorable flower-patterned frock and her sister gathered round a birthday cake. At first the singers sister was blurred our with the Unconditionally singer tweeted. Now the lyric video bakes us into an exciting new adventure that will no doubt have a sexual connotation when we finally see the main video. "If you would like to see my sisters amazing face/pose get #BIRTHDAY trending to the top & I will unlock the genius with you... Hahahahahaha,"
It’s a good choice for the singer, as it returns the her to the T.G.I.F days that we all loved, with a track that strong and pop-a-licious, however it's sad the album has not met same expectations with us at SCP or some pop critics of the world. How do you feel about the new single pop lovers? Katy Perry will be touring in Australia later this year and her album Prism is available on iTunes now..!